In reality, A SAF application might be initiated by stakeholders who seek better information to help them choose amongst management options already proposed, for example, by regional planners. Or the starting gun might be fired by local environment managers, who have themselves identified an environmental problem, or know that they soon have to implement a new law, and would like more information about the consequences of their planned actions. Or scientists themselves may start the proceedings, through their own concern about an environmental problem, or their need to fund their work. In many cases the kick-off will be a messy business, involving repeated meetings between the three groups of actors, during which the essence is slowly distilled from of an initially confusing set of problems, perceived impacts, and potential solutions. Indeed, some of the groups may not know that a 'Systems Approach' is needed, and so part of the 'initial stuff' is to explain about the SAF and how it can be useful. NOTE: In the text dealing with this 'Issue Identification' step, and the 'System Design' step, we refer to Social and Ecological Systems or social-ecological systems. Note that the social part is is meant to include an economic component, and that the term as a whole assumes that such systems are part of real coastal zone systems. In text dealing with the 'System Formulation' and 'System Appraisal' steps, we refer to an 'EcoSocialEconomic System' or ESEsystem. Such an 'ESEsystem' is a Virtual System model, which might be made in parts by building separate sub-models for economics, the social system, and the ecosystem, and then bolting these together to make an ESEsystem model. At some stage (depending on how the SAF application is initiated) a scientific team should be formed to carry out the technical work of implementing the 'Systems Approach Framework'. An application of the SAF needs knowledge of ecology, economics and social and political sciences, together with skills in numerical modeling and the management of relationships with stakeholders and governance. It will be unlikely that one person has all the necessary knowledge and skills, and a SAF application is therefore usually made by a multidisciplinary team. Sharing in a SAF application may lead to this team becoming 'interdisciplinary', as a consequence of team members learning sufficient of each others' technical language for the team to function as a unit, so that the team's work will describe the behaviour of a Social and Ecological System as an entity. The manager of a SAF application should start by considering the available human resources: what people and skills can you draw on? How much of their time is available? How does this fit with the magnitude of the problem with which you are dealing and the deadline by which your stakeholders/customers need answers? Actually, you may not be able to answer these questions in full until the 'Problem Scaling' task in the 'System Design' step. Meanwhile, you need an initial team to identify and meet with stakeholders and to explore with them the environmental problem of concern. Questions may arise about who pays for that scientific study: we don't address those here but see 'Problem Scaling' task about adjusting the SAF application to fit within the resources of time, people, skills and equipment available to the scientific team. Consider, also, a stakeholder's own deadlines. If a decision has to be made about a choice of management options within 6 months, then later information will be no use. The contents of this sub-task depends on how the SAF application has been or is being, started. An 'Issue' may have already been defined, or there may simply be a vague 'problem'. The application team may already exist, or it may need to be put together. The team needs to be, or become, familiar with the SAF metholodogy. There are some overviews of the methodology in the pages of this website; a summary of the initial steps and key ideas in the Guide to System Design available as a pdf document from this website; and a textbook Sustaining Coastal Zone Systems, available from Dunedin Academic Press, Edinburgh. Once the team exists, it will be wise to gain some idea of the context of actual or potential problems, by making a preliminary study of relevant economic and social aspects of the social-ecosystem. Two (pdf) reports will be useful. Monguel et al. (2011) describe the economic dimension of coastal zone systems. 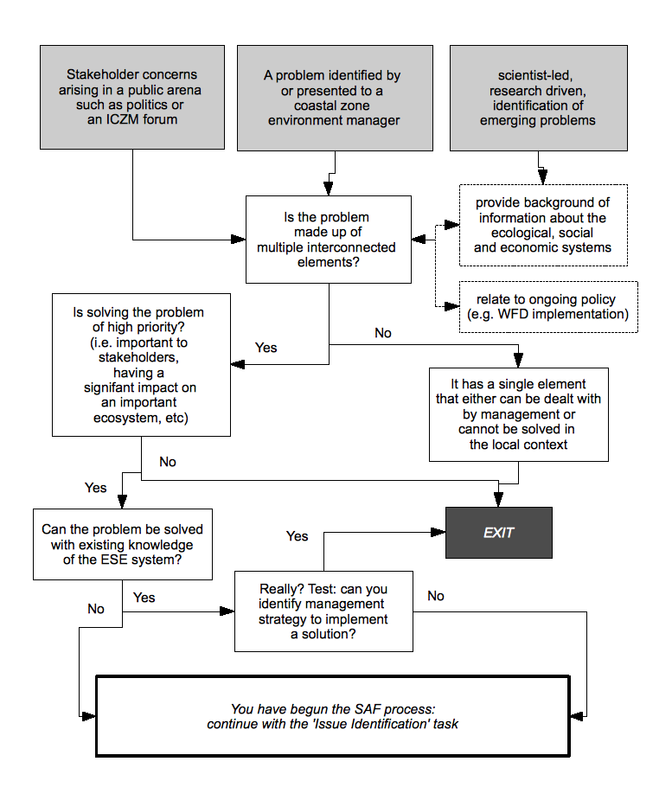 Vanderlinden et al., 2011 deal with stakeholder-policy mapping. Is a SAF application really necessary? A SAF application is appropriate only for some social-environmental problems. An application does not aim to solve problems, merely to give advice to stakeholders and environment managers, so that they can better deliberate about the options available to them. Sometimes solution will be achieved by the discussion with stakeholders and policy-makers or managers that is the heart of 'Issue Identification'. The SAF application need continue only if there remain uncertainties or disagreements that can be reduced by scientific study. Here is a flow diagram to help in deciding whether or not an application is required. This decision will, typically, be reached during the 'Issue Identification' task itself.